We got these babies last Wed. when they were about 3 days old by my best guess. Today they must be about 9 days old. 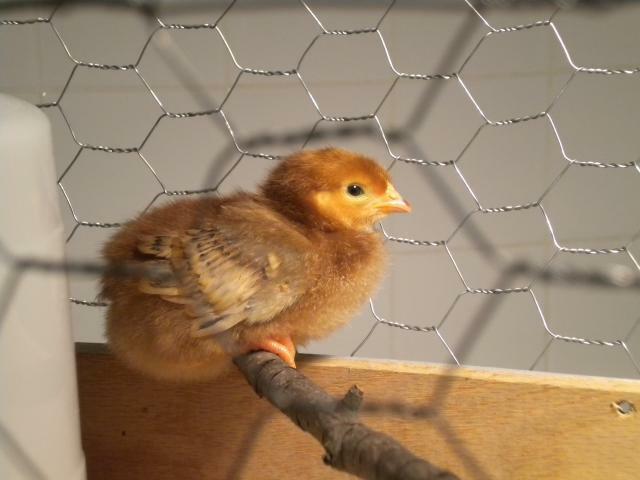 Two of them are already roosting on the little stick I put in the brooder yesterday. It was 38 chilly degrees when we woke up this morning. We've had the heat turned off for weeks and are determined not to turn it back on. 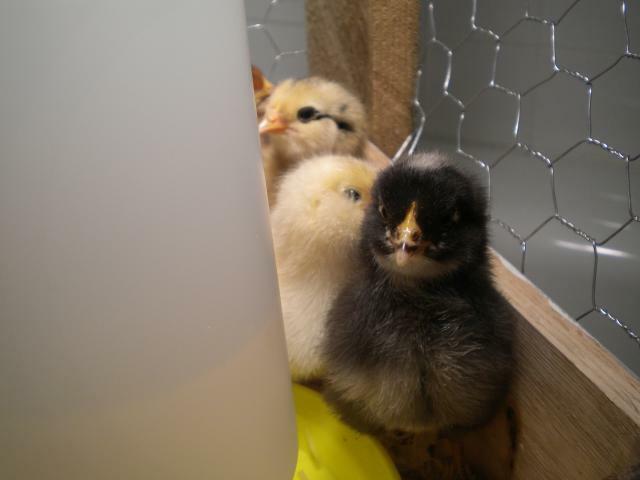 Our little chicks were all huddled under the heat lamp, so I brought out the space heater and put it in the bathroom. Yes, our brooder is in the bathroom, actually in the bathtub on a little table which makes clean up around the brooder a snap. So I brought in the space heater and turned it on. 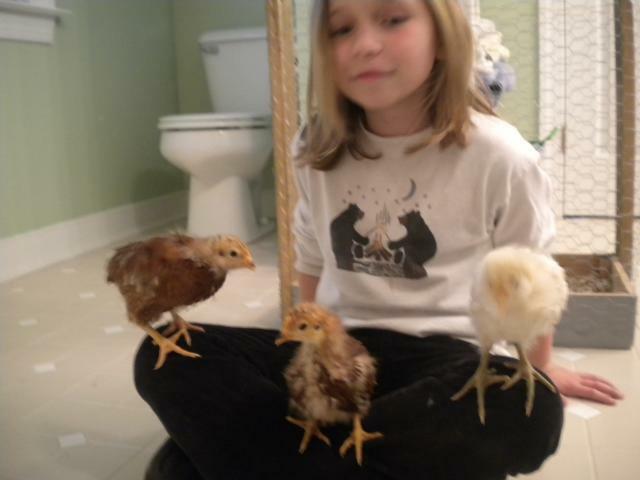 When I went back in to shower a little later, all the chicks were spread out across the floor of the brooder. It was like the sahara in there! Poor babies. So, I turned off the space heater. When I got out of the shower they were all huddled under the lamp again. Come on! So, I turned the heater back on....no I'm not kidding. 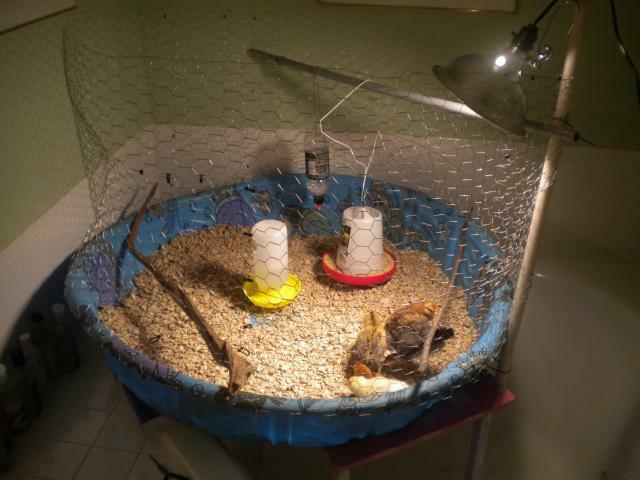 Thankfully the temperature outside is now approaching 70 degrees and things have stabilized in the avian weather center. 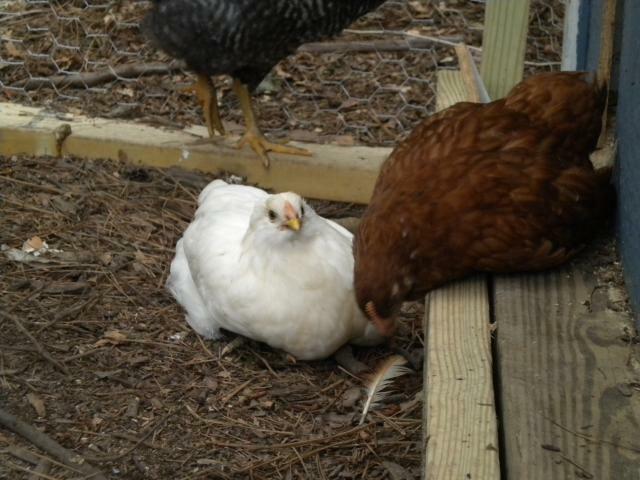 Happy chicks are calmly pecking and scratching in the center of the brooder. Whew! These babies are out of control now. They have become toddlers and are in contant motion...or sound alseep. 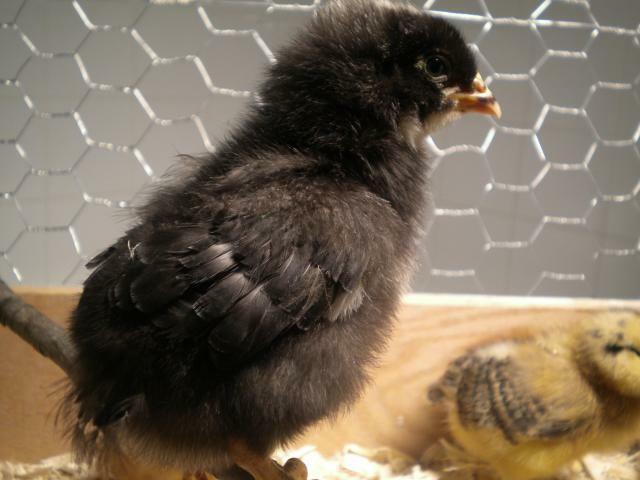 We moved them into a new and larger brooder and they just love having all this room to run and play. And what a racket they make in there chasing each other around. Now they seem to be taking their morning nap. They seem to play hard in the early morning when the kids are up and getting ready for school. Then once the house is quiet again, back to sleep they go. 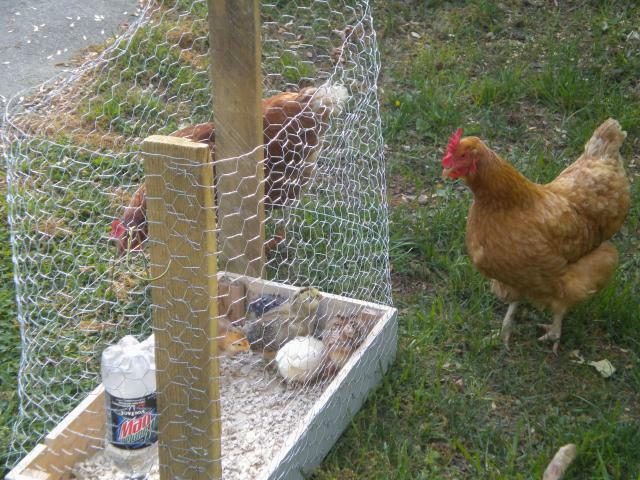 Yester day was their first visit to see the big hens outside. It was a very short visit and seem to go fine. 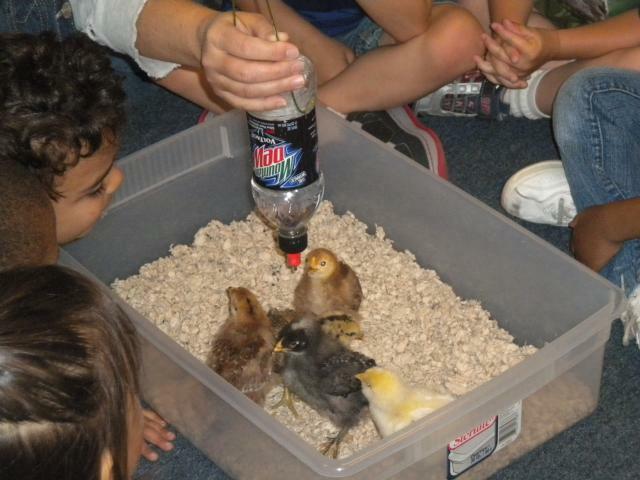 We also took them on a little field trip to see the kids at our local Head Start classroom. Big day for the babies! I'm reminded of an internet joke that made the rounds a few years ago where a man sends his "true love" all the items from the 12 days of Christmas and her house filled up with noisy birds. The babies have been outside for about 2 weeks now. They're so big and they want to free range all the time. 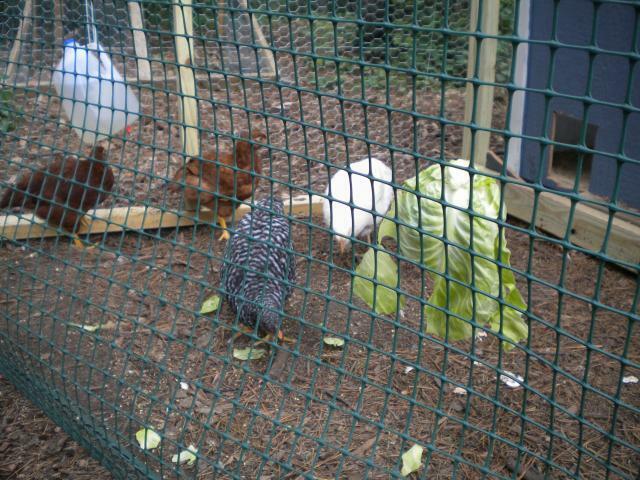 It's harder to keep them in their new coop, but that's where they'll stay for a few more weeks at least. This was our kids playhouse. 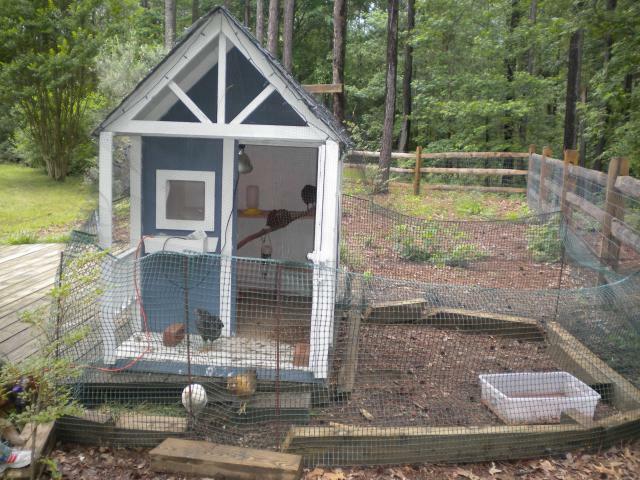 In a few weeks, we'll move it out near the other coop and attach it to the run out there. We'll cut a small chicken door on the other side and leave the big door for human access. Right now we close the big door at night and put that brick in front of it. The whole house and run are also draped with bird net to keep predators out. So far so good. Oh, and notice the little waterer on the shelf...it's the same one they're hiding behind in the pictures above. These babies have really grown! 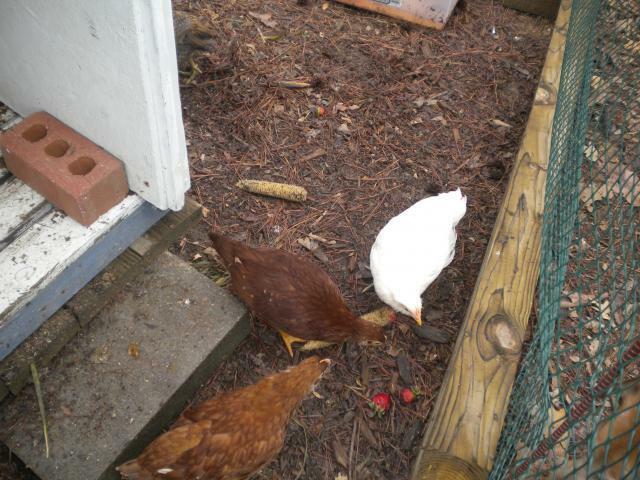 They loved the store bought corn cobs, but are so so on the home grown strawberries. Hmmm. Today we almost finished "Chicken Town". We moved the babies playhouse coop. 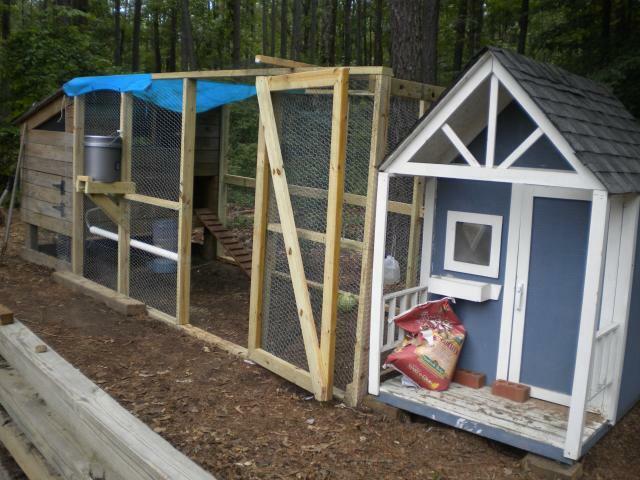 Enlarged the old run and attached the new coop to it so we now have a coop on each end of the run. Built the new watering system, too, and it's great! Babies in their protected end of the run. No one is coming near the scary cabbage hanging in the middle. Black Cutie is the brave one. 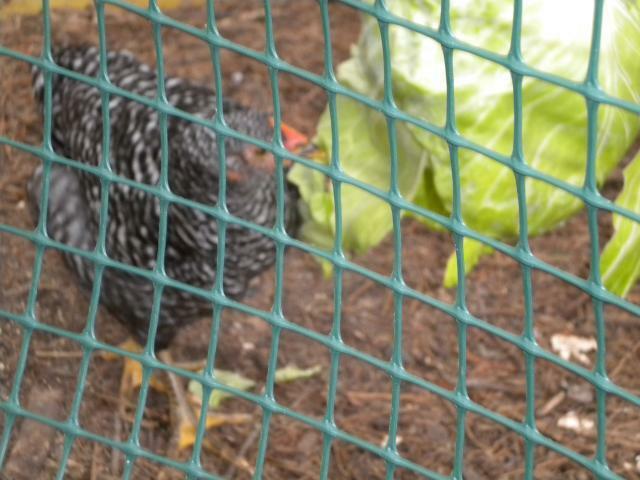 She thinks the cabbage might be fun. Fuzzy Quinn, the white EE, almost died at 2 weeks. She survived and was much smaller than the others for a while, but is now this beautiful young lady. Also kind of bossy! 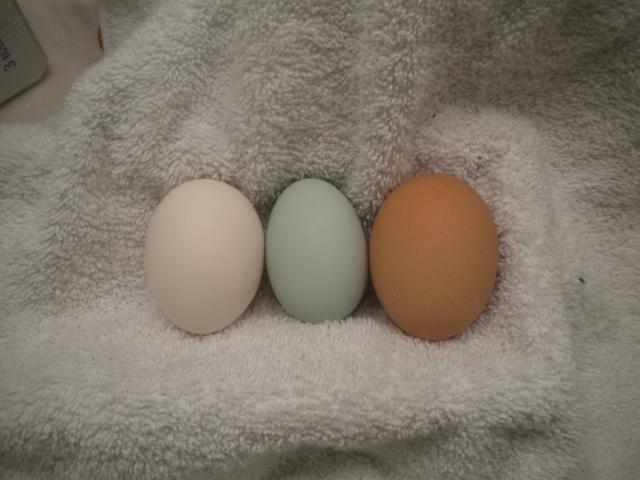 9/2/2010 - Our first green egg!!! Check these out under "Everything Else For Sale". Many holiday designs are available including 5 fun Christmas Card designs. This handsome guy is Stew the Roo. If you look carefully you can see a few of his ladies peeking through the impatiens.